The Certified Supply Chain Professional is considered the most recognized educational program for operations and supply chain management professionals around the globe and is created to meet the rapidly changing needs of the supply chain industry. It encompasses all the operations throughout the supply chain and distinguishes you as a supply chain expert with highly specialized knowledge and skills. Register in groups and before 22nd December to grab the opportunity of flat 30% discount on APICS CSCP training fees. Please send us an e-mail: tcd@knowerx.com, or call us at: +91 77389-26464, for more detailed information. 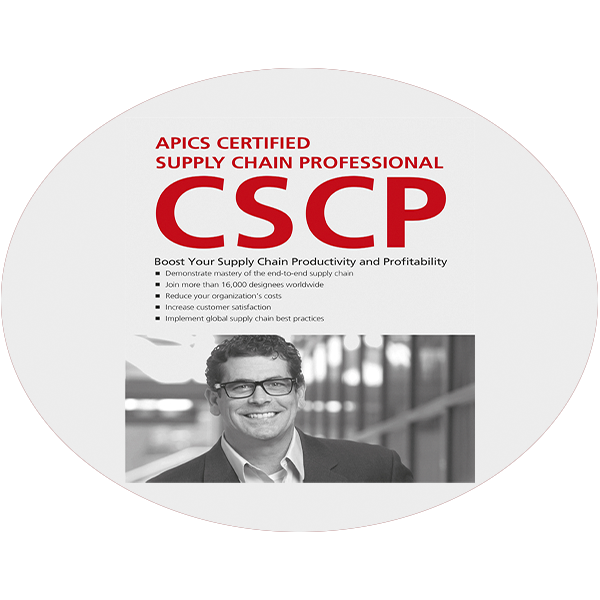 The CSCP Certified Supply Chain Professional Certification was the first professional certification for supply chain and addresses the holistic view of the supply chain, strategies, design, compliance, SRM (Supplier Relationship Management), CRM (Customer Relationship Management), location, technology, management demand, sustainability, and more. PS: Purchase the APICS CSCP learning system from KnoWerX to get discount, save shipping fees and avoid custom hassles. Other courses offered by KnoWerX Education: APICS CPIM, S&OP, Demand Management, Forecasting, Inventory Management, Logistics, Project Management and many more.